You can get a bit antsy. 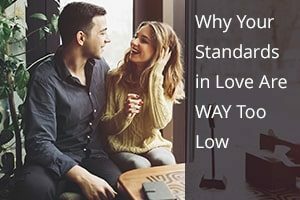 Are your standards too high? Are you not giving these guys a chance? There’s so much pressure to get it right. To pick the right person. To not overlook a diamond in the rough. To not waste your time on duds. No matter what your standards are, they could ALWAYS be higher. Don’t waste your time looking for a man who’s wealthy, erudite, cosmopolitan, and a dead ringer for George Clooney, though. Women tend to be the emotional leaders in relationships. They’re the ones thinking of ways to connect and get closer. They’re the ones reading books and newsletters like this one. They’re always learning how to love better. Well, you’ll spot the occasional man reading a relationship book. (Probably bought for him by the woman in his life.) Men will make an effort if they have to. But they’d rather leave all that stuff to their wives and girlfriends. When a man abdicates his responsibility for the emotional labor of the relationship, the woman gets stuck with it all. SHE feels responsible for the emotional health of the relationship. If the relationship is struggling, it’s left to HER to fix it. It’s too much responsibility dumped on one partner. It just doesn’t work. And the studies are emerging to prove it. A 6-year study of 130 newlyweds found that the strongest predictor of happiness is the husband’s attitude. If he’s willing to work with his partner, listen to her input, and take her recommendations on board, their marriage is much more likely to last. Only a third of the men in the study were willing to accept their partner’s influence, however. Others reacted to their partner’s suggestions with defensiveness, anger, or stonewalling. They didn’t feel they had to do ANYTHING their partner suggested. They saw the work of relationships—negotiating, compromising—as a struggle for power and control. That refusal to address conflict or work through disagreements hamstrings a relationship. What can you do, when your partner refuses to let you influence him? You may think you can live with it, but know this. If he won’t listen to you, your relationship has an 81% chance of falling apart. Of course, women don’t always listen to their partners, either. No one is perfect. But in general women are better at taking their partner’s feelings and preferences into account. That’s their job, as emotional custodians of the relationship. They try to balance everyone’s wants and needs. So how can you use this information to spot the perfect partner? You look for a man who assumes emotional responsibility for the relationship. He wants to stay fit and healthy—for YOU. He wants to go out and have fun—with YOU. He wants to learn how to be a better partner—for YOU. He knows it’s his job to make things work, just as much as it is yours. So he tries hard not to be defensive. He listens to your feelings. He takes responsibility for his part, rather than blaming you when things don’t work out. He seeks advice when he doesn’t know what to do. Most men know to do this in the beginning of a relationship. That’s how they win a woman over. The more they want her, the harder they’ll work to prove how great they are. Then, once they have her, they stop cold-turkey. It’s up to her to take over now. He has done his bit. 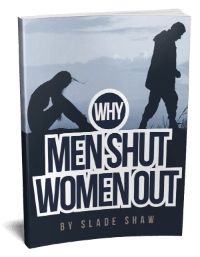 It’s not easy to know whether a man will continue being emotionally responsibility once you’ve committed. 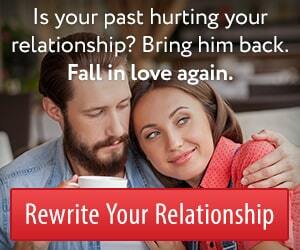 Look for clues in his past relationships. Does he blame his exes, or does he talk about how much he learned? Does he care about his exes’ feelings, or are they dead to him now that they’re out of his life? Look at how he relates to his long-time friends and family members. Does he take those relationships for granted, or does he work at them? An emotionally responsible, emotionally intelligent man is a treasure worth waiting for. You deserve a partner who WANTS to put in the work.